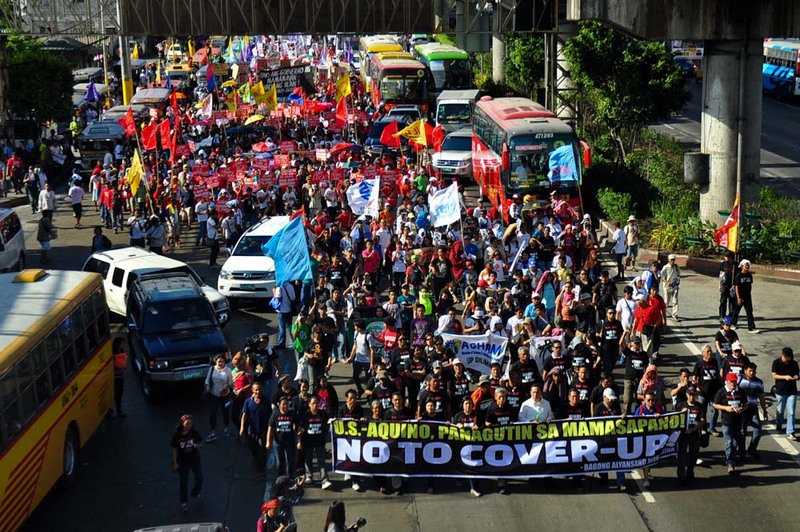 Protesters march along EDSA between Cubao and Santolan MRT stations. The human chain, however, was originally planned to be conducted between Camp Crame in Santolan all the way to the EDSA Shrine in Ortigas. However, police officers barricaded EDSA southbound a few blocks away from Camp Crame, stopping the throng of protesters and inhibiting the free flow of traffic. A human chain was formed by people positioned side-by-side with locked arms. According to Fr. Ben Alforque from the Missionaries of the Sacred Heart (MSC) and participant in the planning with the National Capitol Region Police Office (NCRPO) for the rally, the plan was already ironed out in a discussion the day before. Fr. Alforque was surprised when Police Chief Supt. Diosdado Valeroso, NCRPO Deputy Regional Director for Administration, sent a text message on the “sudden changes”. Father Ben described the incident as another case of “walang koordinasyon (miscoordination),” taking a dig at the miscoordination of command in the Mamasapano incident which the President had ultimate command and that led to the death of 44 Special Action Force (SAF) troopers last January 25. Manila Auxiliary Bishop Broderick Pabillo meanwhile questioned the act of stopping the people from staging the program in commemoration of the People Power of 1986 which toppled the dictatorship of the late Ferdinand Marcos. “Hindi po talaga ako mahilig sa rally, kaya po ako pumunta dito ay alam ko ito ay isang mapayapang pagtitipon, wala naman po kaming ibang balak kung hindi ang magdasal, magpahayag ng damdamin, kaya nagtaka nalang ako bakit bawal na ang ganyang mapayapang asembleya (I am personally not fond of rallies, but I went here knowing that this would be a peaceful assembly. We only wanted to pray and express our feelings. This is why I wonder why such a peaceful assembly is being halted),” Bishop Pabillo said. An interfaith mass was originally slated to take place prior the human chain. “We choose to fight for truth and accountability and meaningful change, thus Aquino must go,” Bagong Alyansang Makabayan (BAYAN) Renato Reyes, Jr. said. According to Reyes, the President has seemingly refused to be held accountable for the Mamasapano incident. “The past month has seen the President repeat one lie after another in order to escape accountability in the Mamasapano debacle. Aquino merely shuffles the blame between SAF Director Napenas to suspended PNP Chief Purisima. Aquino takes none for himself. He has no regrets authorizing a suspended general to run the operation,” Reyes said. Protesters called for the resignation of President Aquino. BAYAN also said the President must quit hiding from the “memory of his parents” to avoid accountability. “EDSA was also about holding those in power accountable. Aquino cannot make himself an exception in the quest for truth and accountability,” Reyes added. Besides calling for the President’s removal from office, the group also called for the creation of a transition council called “People’s Council for National Unity, Reform and Peace.” According to groups calling for the president’s resignation, this will be formed “through a democratic process from the wide array of organizations, groups, and individuals involved in the movement to compel Aquino’s resignation”. This will be an “extra-constitutional” route of replacing the President in case of an ouster tagged as “Power of the People.” The transition council formed will replace the president before holding elections in 2016. As a tribute to the historic EDSA people power, Reyes honoured the people’s efforts in making the said event possible. “EDSA is not about one color (yellow) nor the plight of one family. It is about the people rising for change,” Reyes said.